What Are the Benefits of Olive Juice? Olive juice, what we know of as olive oil, contains a wealth of nutrients that can benefit your health in a variety of ways. Though olive juice provides many health-promoting benefits, it is not a miracle cure and it contains a high calorie and fat content. Do not consume it at the expense of eating a well-balanced diet. Proper nutrition plays an essential role in living a healthy lifestyle; consult your doctor when making changes to your diet. Olives contain rich amounts of heart-healthy fats, according to Mayoclinic.com. They are natural sources of the plant-based unsaturated fats and contain rich amounts of monounsaturated fats. Consuming these fats instead of saturated or trans fats can help you improve your heart health while lowering your risks of developing heart disease. Eating foods rich in monounsaturated fats can help lower your total cholesterol levels. Olive juice can be used to help stimulate hair growth and keep hair healthy, according to Holistic Online. The vitamin E in olives can increase blood circulation to your hair follicles, which could stimulate hair growth. After shampooing, give yourself a warm olive juice massage. Gently apply 1/2 cup of warmed olive oil onto your scalp when your hair is still wet. Use your fingertips to massage the oil into your scalp and hair. Be sure to cover your entire scalp. Wrap your head in a towel and let the oil stay in your hair for 30 minutes. Shampoo again to remove olive juice, and rinse your hair thoroughly. Repeat this massage weekly to maintain hair and scalp health. Eating a diet based on plant-based fats, such as a Mediterranean diet, may help reduce risks of developing Type II-diabetes. This can occur without losing weight or counting calories, according to the National Institutes of Health. Diabetic risk factors including high blood pressure, elevated blood sugar and triglycerides plus abdominal obesity can be curbed by eating a diet rich in unsaturated fats. The monounsaturated fats found in olives may play a role in fighting various inflammatory disease processes, including diabetes. The Mediterranean diet is particularly rich in olive juice, vegetables, grains, legumes and fish. Olive juice contains anti-inflammatory properties found in its polyphenols, flavonoids, vitamin E and monounsaturated fat content. These properties can help reduce the severity of various health ailments involving inflammation throughout the body. Experts at the National Institutes of Health believe that a variety of diseases may be affected by low-level, chronic inflammation throughout the body. Inflammatory ailments include osteoarthritis, rheumatoid arthritis, heart disease and asthma. The vitamin E in olive juice may help diminish the severity and frequency of menopausal symptoms such as hot flashes. Olive juice can help lower your chances of developing gastritis, an inflammation of the stomach, according to Tony Polito, a chef and nutritional food consultant in Boston and New York, writing for the Shrewsbury Lantern. Olives are good sources of vitamin E, an antioxidant. Antioxidants help neutralize free radicals throughout the body that oxidize your blood and harm your cells. This can damage blood vessels and arteries. Left unchecked, free radicals can lead to the development of heart disease, stroke or heart attack, cancer, tumors and gastrointestinal disorders, according to the World's Healthiest Foods. 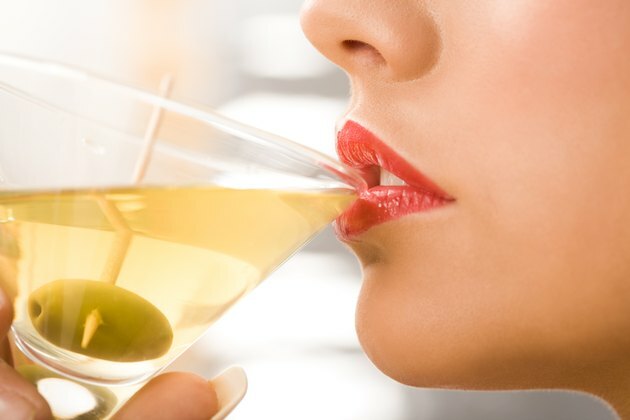 Olive juice can improve heart health by lowering cholesterol levels, according to Mayoclinic.com. The high amounts of unsaturated fat in olives can reduce harmful low-density lipoprotein levels while increasing beneficial cholesterol, otherwise known as high-density lipoprotein.